We moved to Candle Cafe for our next Vine and Dine pair of challenges. Again, this is a book I’ve had for quite a long time but only made a few things from. I approached it with caution though as I find that recipes in restaurant cookbooks generally tend to be less well tested and prone to mistakes than those where authors have real kitchens and are usually cooking for family amounts of people rather than crowds. Our first pick was the seitan picatta because it seems to get a lot of attention on forums and blogs – both the recipe and the dish in the restaurant. So much so it was surprising that neither of us had ever made it. I chose the garlic mashed potatoes and the sauteed mixed greens as hearty accompaniments. It was a very easy meal considering the depth of flavours it contained. With both the potatoes and the greens I used the methods but didn’t follow the amounts because really – 6 potatoes is going to give you 8 side dishes of mash? Not in this house. And I don’t like recipes which talk in bunches – your bunch of greens could be double or half the size of my bunch of greens. It didn’t really matter though – I just used the amount of potatoes and greens I’d normally use for 2 people and guessed at quantities for the rest of the ingredients. I plated this up rather inelegantly for what was actually a very elegant tasting meal. Just a note on the white wine in the dish – I have been using Sainsbury’s House Dry wine for cooking recently – it states on the label that it is suitable for vegans and at £3.79 per bottle, and with a screw cap, it’s great to have around for sploshing into food. The wine we chose to go with the Seitan Piccata was once again chosen on the principle that if you haven’t got a clue about how on earth to match the flavours in the dish, you might as well make sure you are drinking something you really enjoy. So we went for wine which we normally drink with Sunday roast, a Battle of Bosworth Shiraz Viognier, a sort of Aussie Côte Rôtie from the McLaren Vale, the Mediterranean of South Australia. We had the 2007. You get meat flavours including bacon from the Shiraz, toned down and smoothed by the perfume of the Viognier, and with loads of lovely chocolate and brambly berry fruits, plum and licquorice. It sells for £14.50 from Vintage Roots and makes roast potatoes and gravy taste even more like the food of the gods if that’s possible. Shame we weren’t eating roasties. The difficulty with matching the seitan was not the lovely pile of mashed potato on the side, but the challenge was to find a wine that blended harmoniously with both the meatiness of the seitan and also the salty sea flavours of the capers and the sour lemon in the sauce. This was great wine and great food but the two definitely didn’t meet. It was a good idea to get a big flavour, but we did need something that had a bit more of an acidic note. 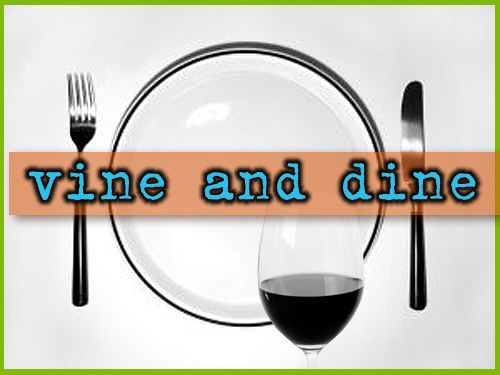 White wines are more acidic than red, but then you’d lose the match with the fake meat and potatoes, so perhaps a cool climate red would have been a better bet, if you can find a vegan one. Vintage Roots new Chilean blend, Etnico, which is Syrah Cabernet Sauvignon and Merlot, and only about £7.75 might do a job for you? 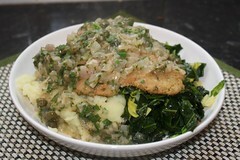 Don’t forget to check out Tami’s blog and see if anyone else managed a good wine match with this really difficult dish! This entry was posted in Candle Cafe, Vine and dine by efcliz. Bookmark the permalink. This was a tricky pairing. I hope I can find some of the wines you list. They sound so good!